Welcome to this month’s installment of the NFA series! Today, we are going to talk about how to save money, specifically for a big event like a convention. I have spent the past few months saving up for my first trip to NFA, and I have a few tips to share with you. Some of these tips do work for other areas of life, like a new instrument. So even if you’re not going to any big convention this year, hopefully you can learn a little something. Without further ado, here are my biggest tips for saving for a big trip or event. As soon as you know you want to attend a convention or go on a trip, start saving. The more time you have to save up, the easier it will be. If you have, say three months to save, you won’t have to be as strict as if you only had one month. I knew last fall that I wanted to go to the 2018 NFA convention, so I upped my savings game. Since I don’t have a ton of expenses right now, I took the money I would have been spending and put it into a savings account. Each time my paycheck comes in, I put the majority of it into savings and leave just enough in my checking. This keeps me from being tempted to go and spend that money, and my savings account earns interest, so I can save even more. 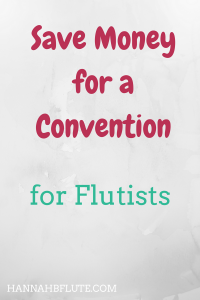 Some things, like convention registration and membership fees, are fixed. But flights, hotels, and car rentals differ. Shop around to find the best deals on flight and hotel. I personally wanted to stay at the convention hotel to cut down on ground transportation, but if you want to stay somewhere cheaper, do it. Researching your various convention expenses will help you figure out how much the trip will cost you. Knowing the costs will also help you budget before and during the trip. If you’re traveling to a higher cost city, like LA or NYC, plan to spend more on food and other accommodations. If you’re traveling to the Midwest, you can get away with spending less. Some conventions will have early bird registration fees that come with a discount. If you register by a certain date, you can get your ticket for cheaper. Some hotels will also fill up quickly, so if you want to stay where the convention is, book your room early. Same goes for flights. As you get closer to the trip, seats will be taken and ticket prices will rise. If you plan to participate in any special events or competitions, be aware of those deadlines, too. Some events will accept participants at the convention, but others will require previous registration. Plan on bringing snacks, an empty water bottle, and other necessities with you. Sure, it will seem like a lot of money, but you will save. A bottle of water at the airport can cost over $3. Snacks are also ridiculously expensive. Bring your own toothpaste, toothbrush, and other toiletries. Those costs add up, too. And because not all hotels have free breakfast, or your schedule won’t match up, have some breakfast bars in your bag. That way, you can eat in your room and not be tempted to order expensive room service. When buying your convention ticket, don’t forget about any potential membership fees you’ll have to pay. If you plan to spend $300 on the convention itself but there’s a $70 membership fee, you can easily go over budget. And for traveling? Flights can be delayed or cancelled, rental cars might not be available, there could be a ton of traffic, etc. While you can’t expect everything, don’t be surprised if your plans get derailed. Know what you need to do in case something happens. If you will be bringing an instrument, make sure you know how to transport it and store it during your journey. Know if you need to buy an extra plane ticket for your instrument. Splurge a bit on insurance. It may sound like you’re not saving money, but a $200 insurance plan is a lot cheaper than replacing a $2000 flute. And of course don’t let your instrument get checked. Don’t get on that plane without your instrument in hand. That’s the only way you can guarantee its safety. Have you even saved up for a big trip like a convention? What are your tips? Leave a comment below!